Can you help Maximus navigate the treacherous undersea landscape and locate hidden treasure? 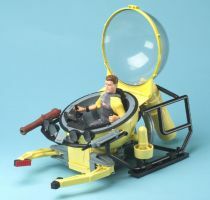 With his capsule Submarine, he's ready to go on the search for adventure, deep beneath the blue waves. The submarine really seals airtight, and the recovery pincer arms actually work to grab underwater objects! Reveal all the ocean's secrets with Maximus and the rest of the Adventure Crew!